Google’s Nexus phones have been favorites among die-hard Android fans for years. But in 2016, Nexus is no more. Google has replaced the line with Pixel, two new phones with “pure” Android, a so-called best smartphone camera ever, and filled with Google services. There’s a 5-inch Google Pixel and a 5.5-inch Google Pixel XL. Both Pixel phones have a 12.3MP camera, and according to Google, the phones scored the highest-ever rating for a phone on the DxOMark camera test. So you’ll never be without Google’s immense knowledge, the phones come with a built-in Google Assistant that lets you get answers to pretty much any question you will ever have, says The Verge. Just press and hold the home button and you can search the Internet for anything, ask Google for help with dinner reservations, fetch pictures, play music and a whole lot more. Both Pixel phones come with a fingerprint sensor you can use to unlock the phones that Google calls Pixel Imprint. While the Pixel phones were actually put together by smartphone manufacturer HTC, The Verge says Google is taking all of the credit for designed and engineering them. That’s a big change from Nexus phones, which always carried their manufacturer’s name with them. If you buy a Pixel phone, Google will give you free unlimited storage for photos and videos in Google Photos, which is built into the phones. Pixel and Pixel XL both come with Google’s Android Nougat 7.1 operating system, and they will be the first phones to get new software updates when they’re available. 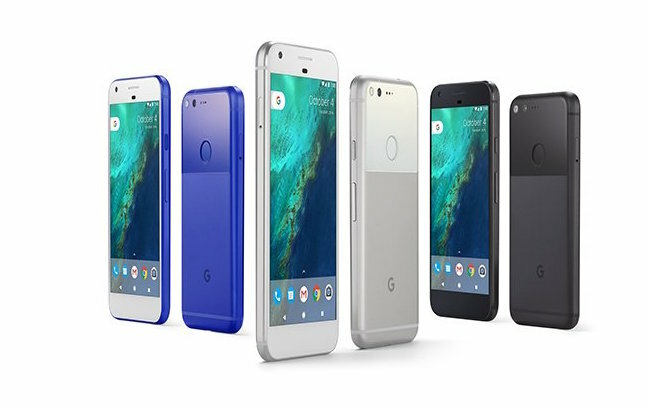 The Pixel phones go on sale at Google’s online store and at Verizon first. They’re available for pre-order today, starting at $649. There are three colors choices: Quite Black, Very Silver, and Really Blue. Looking to pick up a case for the new Pixel phones? Speck is coming out with Presidio CLEAR and Presidio GRIP cases that will be available in the coming weeks. Head over to the Presidio CLEAR Pixel and Pixel XL, and Presidio GRIP Pixel and Pixel XL pages to sign up to be notified when they’re ready.